One of the many hurdles of developing themes for Shopify or any other cloud eCommerce/CMS is setting up your local development environment, especially as a front end developer. Luckily, with the release of Shopify’s Slate, you can take an existing Shopify theme and have it ready for local development with Git and NPM in no time. This short guide will take you from cloud to local development in under 5 minutes. Alternatively, you could have a look at Shopify templates from other Marketplaces. As example, Multify theme, could be used to any purpose and category. You should have Git installed on your machine. Here’s a handy guide on installing Git for Windows, Linux, or Mac. You will also need NodeJS 6.x and npm as well. Installation instructions for these can be found on the NodeJS website, under “Download”. This guide assumes you have some familiarity with the Linux command line. Now that we have that out of the way, let’s move on to Step 1 of the guide! 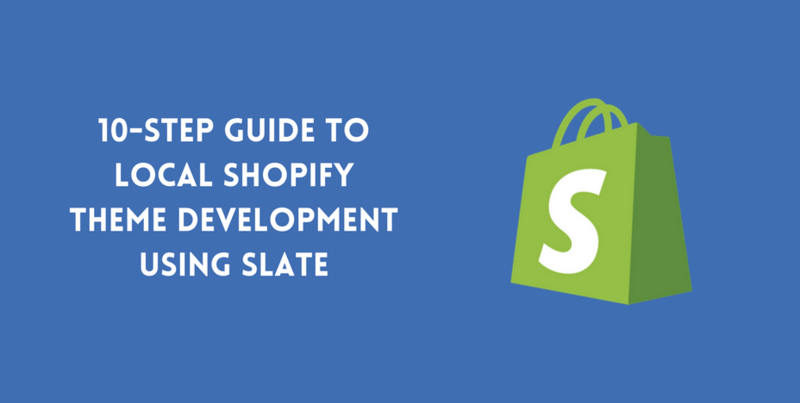 To get started with local development on an existing Shopify theme, you will need to start by downloading your theme file. Login to your Shopify store admin dashboard and navigate to Online Store > Themes, in the left sidebar. Scroll to your current active theme and in Actions dropdown, click “Download Theme File”. After clicking “Download Theme File”, you will be notified that your files have been sent to the email address you are currently logged in as. Head on over to your email account that you use for your Shopify admin and find the email containing your theme files. Unzip the folder and then you’re ready for Step 3. Note: By initializing the git repo early on in the setup process and committing after each step, we can easily roll back changes if some error pops up in our setup process. Commit the .gitignore to the repository. 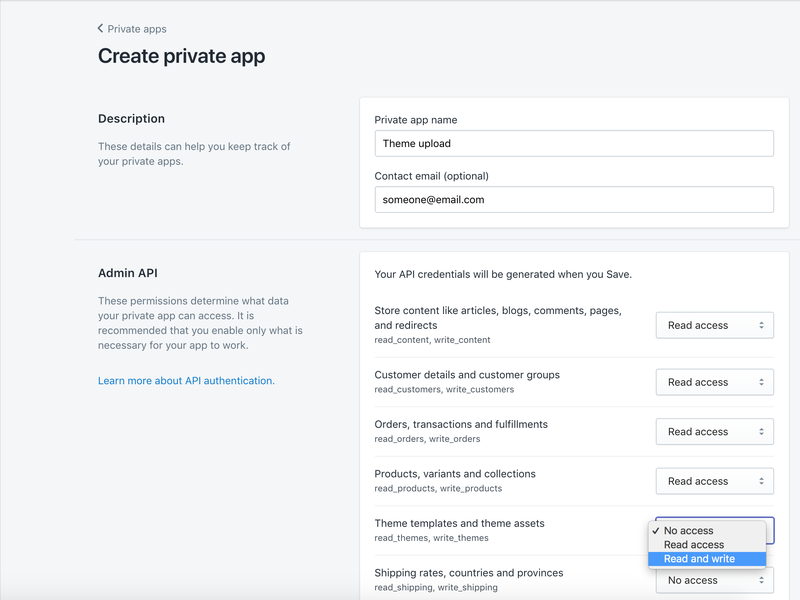 You will need to create a private Shopify App with permission to use the theme’s API to configure deployment to your production and development sites. From your Shopify admin, click on “Apps” in the left sidebar, and then scroll to the bottom and click “Manage private apps”. Click on the purple “Create a new private app”. On the next screen, be sure to expand the list of permissions and change the dropdown for access to the Themes API to “Read and Write”. After making that selection, scroll to the bottom and click “Save”. On the next screen, you may want to grab the Password for the App you just created. We will need it in the next step. Note: You will need to create a Private App via the above step for each environment you want to configure. It is highly recommended to configure both production and development environments to take advantage of this development workflow and most importantly, to keep things in sync! We will need these commands for Step 10. Step 9: Migrate your theme with Slate! If everything ran with no errors, we are ready to move on to Step 10. Did we make it to the line in under 10?! If we didn’t this time, I know you’ll be able to shave minutes off your time on subsequent setups for your other Shopify themes. For more information about Slate, check out the docs or view the source. Need help with your Shopify theme? At Cadence Labs, we’ve had years of experience developing Shopify themes. If you need help, head over to the Cadence Labs contact page, or email us at info@cadence-labs.com. We offer affordable rates for our Shopify services. Contact us or send us an email at info@cadence-labs.com. I installed Slate successfully, but running commands doesn’t work – it just says ‘command not found’.